Lou Dobbs begins his interview with Attorney Victoria Toensing and her husband, former US Attorney, Joe diGenova, by playing a clip of Adam Schiff as he broke the news that their efforts to obstruct the release of information of Democrat corruption to the American people by Rep Nunes had failed. Of course, the Bobble-Head didn’t admit the Democrats, himself included, were a bunch of self-serving parasites abusing the power entrusted to them by the American people. He’ll maintain his innocence and that of the criminal Obama-Clinton-Soros Mafia all the way to the gallows. Dobbs points out Schiff’s in his claims that he valued accurate information and non-politicization of intelligence, with his March, 2017 reading of the unvetted and politically crafted false dossier into the Congressional record. It seems information needs to be non-political and accurate only when it is critical of the globalist Dems. Toensing points to the witch hunt’s ridiculously broad scope, which allows Mueller to venture off on any potential tangent he might choose, that it covers “any link between the Russian government and anyone associated with the Trump campaign.” She notes that could be an anonymous corn farmer in Iowa who sold his product to Russia and was also a Trump supporter. 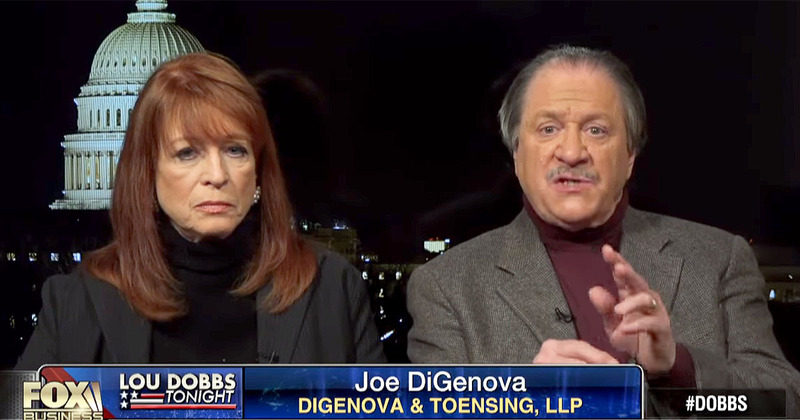 DiGenova is like the no nonsense guy. I hope he knows some inside scoop and see a whole conga line of frog marches. first off, we the people NEED to see what’s in those MEMOS, then go from there. 2nd ROD ROSENSTEIN NEEDS REMOVED HE IS PART OF THAT CORRUPTION AT THE DOJ. 3RD, SESSIONS either needs to GET REAL, OR GET GONE. if what i suspect is just the basis with those memos, then the REST will make WATERGATE LOOK LIKE A SUNDAY PICNIC. and it ALL STARTS WITH THE MUSLIM FRAUD ON DOWN. You mean the lying Muslim who said he was a Christian when he got elected. Love your ideas. Hopefully they will come true. DiGenova is great, no BS. Rick, Enjoy your website! I wish the President would put the memo out there before some brain dead judge decides to stop it. If that happens, the President should ignore whatever the Dems come up with to stop the memo from coming out. In fact he should ignore all of the Obama appointed judges’ orders so far. He also needs to find whoever the leakers are in the WH and fire all of the Obama people that are left there. Wishful thinking, I know, but it would stop the leaks.